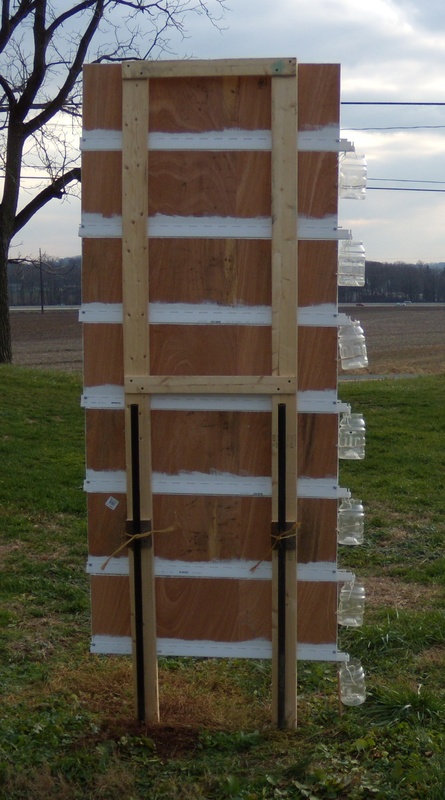 The SARE patternator is based on using painted plywood panels to catch the spray from an air-blast sprayer. 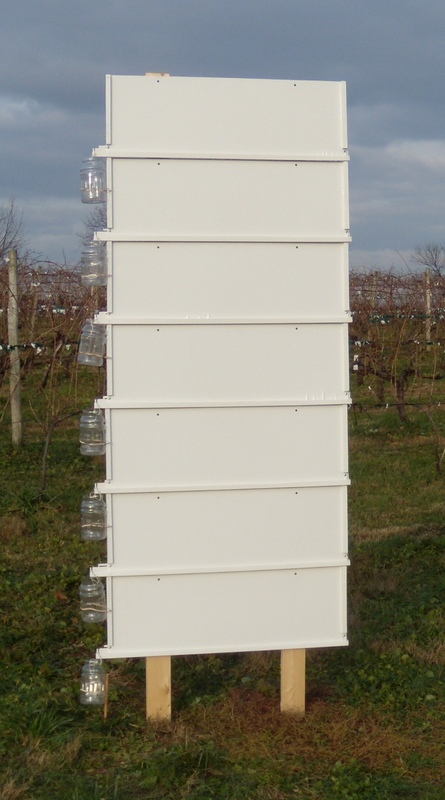 Parts and instructions are for building an 8 foot tall vertical patternator for vineyard use. It is divided into numerous sections that allow the user to quantify the amount of spray in each section. This design divides the patternator into seven sections of three feet by one foot. If a taller patternator is needed the design can be extended. Cut seven identical Lauan plywood panels of 1' by 3'. Place the strips of wood along each 1' side of the plywood panels and flush with the top. Attach each strip with two 1/2” 6x wood screws. Paint the plywood panels with primer and high gloss enamel. Cut J channel into 40.5” long sections and remove lip from low side, leaving it about 3/4” high along the front side. A tin snips works well to cut the J channel. All the J channels must be closed on both ends. Fold in 3/4” of the J channel to form an end and secure with a pop rivet, screw or nut and bolt. A 3/16” pop rivet works well. Seal the ends with silicone caulk. Drill a 1/2” hole at the same end of all the J channels. Make up seven identical J channels. At the end of the J channel with the 1/2” hole, about 1/4” from the end, cut about an 1/8” wide slot on both sides of the J channel. The slots should end about 1/2” from the bottom. 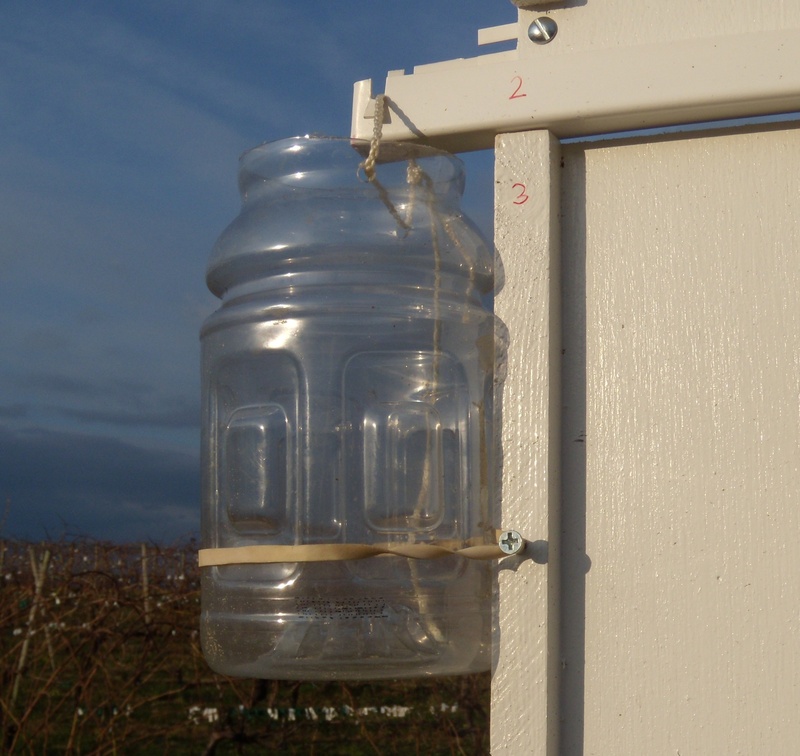 A container with a string will be suspended from the slots to catch the water running from the J channel. Place the plywood panel in the J channel and secure the bottom of the panel to the J channel with two 1” - #8 machine screws and nuts. The panel should be positioned very close to the end of the J channel opposite the hole. The J channel should extend about 2.25 inches from the panel on the other end with the 1/2” hole. Construct a frame with the 2x4's and furring strip. The 2x4's should be around 20 inches apart on center with the 4” side to the front and back. 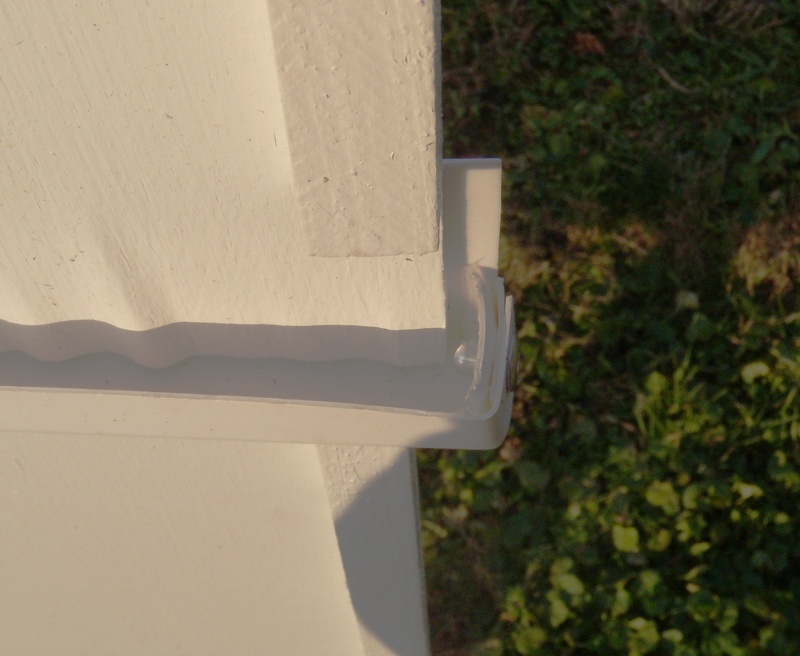 Secure the proper length of the furring strip to the top and center of the 2x4's with 2” deck screws. Prepare two square blocks from 2x4's. Cut about a 1/2” deep and 1/2” wide channel in the middle along one long side of the block. Attach the blocks with 2.5” deck screws to each 2x4 support about 2.5 feet from the bottom and the slot should be perpendicular to the length of the 2x4 and against the 2x4. Drill two 7/64” holes through the top of each plywood panel. The holes should be about 20” apart so the panel will be centered on the 2x4 frame. Place the first panel at the top of the wood frame. With a panel that is three feet wide, there should be a 3/4” drop (1.2 degrees) from one end to the other end of the panel. Mark the 2x4's for placement of the panel. If the 2x4's are 20” apart on center, the drop will be 7/16” on the center of the 2x4's. 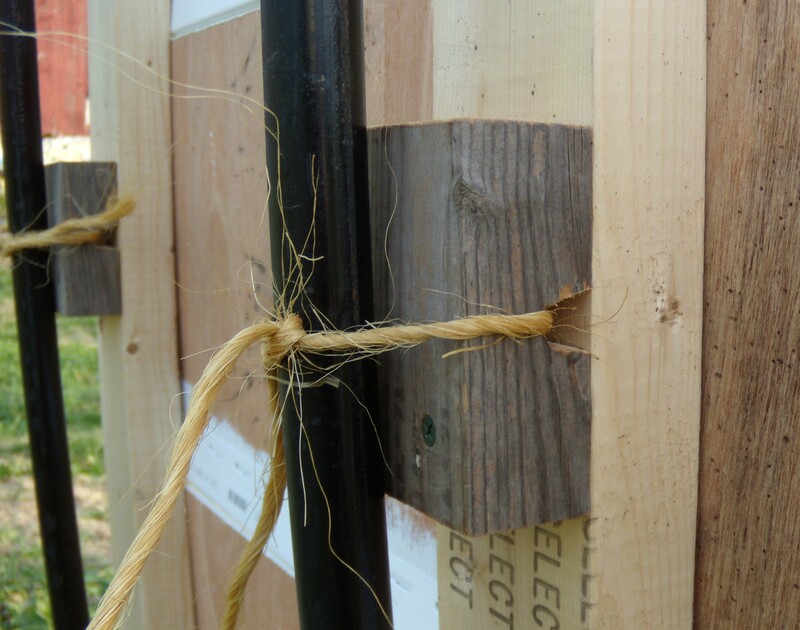 Secure the panel to the frame with 1” deck screws and repeat the procedure for each panel. Hang a container from the end of each J channel. Polyethylene terephthalate (01 PET or PETE) sports drink containers work well. Place a 1” wood screw or small screw hook on the wood strip on the front and back of six panels , so about half of the screw protrudes from the panel. The top panel will not need these two screws. The screws will be placed on the side of the panel with the container, about 1” from the bottom of the container. Secure the container to the screws with a rubber band. Place the two T posts in the ground about 1.5 feet deep and 20 inches apart. The patternator will held to the posts with ropes or twine placed through the slots in the wood blocks. 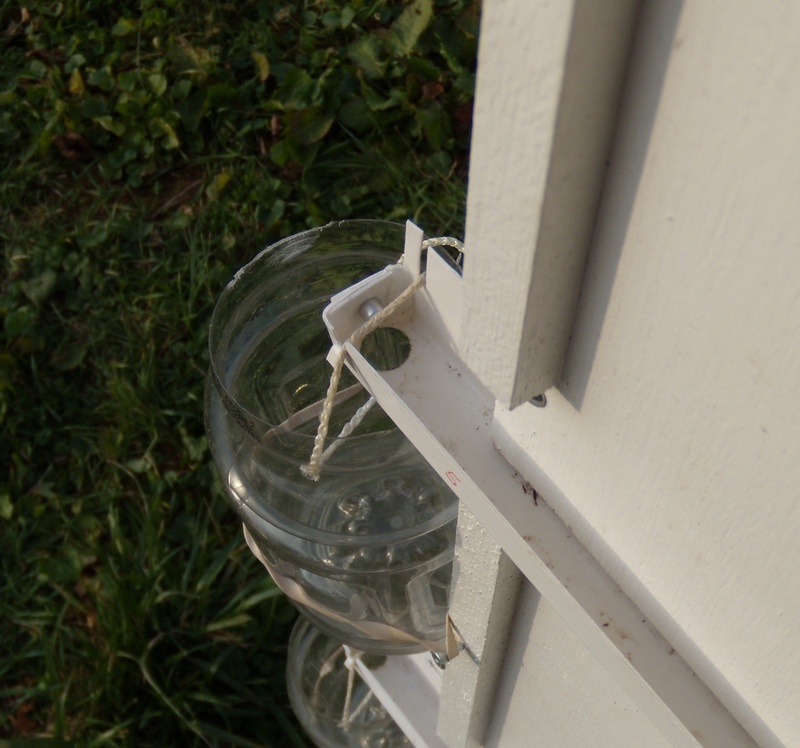 Secure the bottom container with a rubber band to a rod or stick placed in the ground. Plug the tip of the plastic syringe body with silicone caulk. After collecting spray, the contents of the containers can be measured with the large syringe or the depth can be measured with a ruler. Important: To avoid the possibility of pesticide contamination, all measuring devices and containers should be dedicated for use only with the patternator. Use clean water only in your sprayer when testing with a patternator. Do not use a pesticide mixture.